I figured out what's missing. Or just not there, I suppose. It's his face. It's a bit longer and pointier than most people draw it or how I've seen it. But I love it, great job! ...Isn't it convenient that there's a setting with a sweater that's just like in HP? They are so right. Missing something! Good Job, though! I agree w/ LOVLY, Something is missing but its cool. 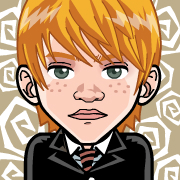 Check out my avatars please, I LOVE doing HP characters.